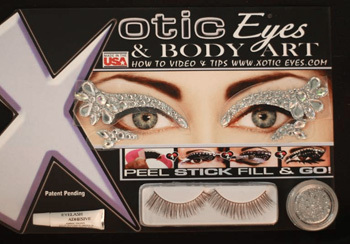 Glamorous and dramatic, this adhesive eye makeup kit is fast and easy! Includes eye tattoos, adhesive, fake eye lashes, and matching glitter. Glamorous and dramatic, this adhesive eye makeup kit is fast and easy! Includes eye tattoos, adhesive, fake eye lashes, and matching glitter. Perfect for stage, parties, red carpet, cosplay, Halloween, and more! Xotic Eyes was founded by international artist, Shannon Maxey who has created an exclusive patent pending line of wearable art for women and men seeking instant glamor and show-stopping results. Maxey's artistic designs are applied to a top of the line skin contact premium grade acrylic-adhesive, making it wearable and sweat proof. The line's instructions are as simple as Peel, Stick, Fill and Go! PLEASE NOTE: For health and hygiene reasons, this item is not returnable. Thank you for understanding.